Side with Bliss or Gloom, rally your Emotions and shape the Inside World's Identity in Cerebria, an upcoming area control team game from Mindclash Games. 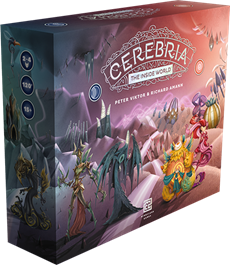 Players assume the role of Spirits, followers of the Inside World's two opposing forces, Bliss and Gloom, with the goal of shaping Cerebria's Identity to their image. For that purpose, they have been granted power over the Emotions, Cerebria's denizens: they can invoke, move, empower and evolve Emotions to influence and control Cerebria's Realms and Frontiers. Cerebria's state is in constant flux until a Spirit triggers a Revelation - these are key moments in the game when the current game state is evaluated and is preserved as a permanent Bliss or Gloom fragment on the Identity. Which side will dominate the Identity, who will establish final control over the Inside World? The game's Kickstarter ends in just a couple of days, so take this opportunity to immerse yourself in this new and vibrant fantasy world.